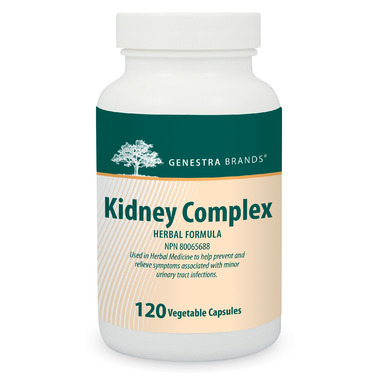 The Genestra Kidney Complex was specifically formulated with herbs, such as cranberry and uva-ursi, used in Herbal Medicine to help prevent and relieve symptoms associated with minor UTIs. Cranberries are rich in polyphenol antioxidant compounds such as proanthocyanidins, which reduce the adhesiveness of E. coli bacteria to the uroepithelial cells that line the bladder. Regular cranberry supplementation helps to reduce UTI incidence in women at an increased risk of UTI, and may help to improve lower urinary tract symptoms in men. Similarly, uva-ursi is used in Herbal Medicine to help relieve symptoms associated with minor UTIs, including burning sensations and frequent urination. To further support good health, Kidney Complex contains European barberry, an herb traditionally used in Herbal Medicine to help stimulate the production of bile and relieve digestive disturbances. This blend includes additional important herbs, such as corn, stinging nettle, saw palmetto and three-leaf caper. Three-leaf caper, also known as Varuna in Ayruvedic medicine, has a long history of traditional use.